Brutal drive to Wynwood to get to the art fairs - that needs to be fixed... how? see this. Bit of a slow day, as all dealers seem to be commenting about how the separation of Context Art Miami from its sister megafair Art Miami has/will affect Context. Personally I think that Context has begun to outshine its elder sister - not just me, but loads of collectors have expressed similar views; only time will tell. With Audrey at the wheel of the huge cargo van, we arrived just in time after spending nearly an hour to go the last 2-3 blocks in Wynwood. By eleven AM we were set. I strolled a little and spent some time speaking to Ciara Gibbons from Gibbons & Nicholas, a wonderful Irish gallery with a powerfully curated booth dealing with socially inquisitive artwork that addresses the worldwide problem of mass migrations. It would be good to see that artwork and those Irish artists in a DMV museum... very appropriate to these interesting times. In the late afternoon we finally broke the ice and sold one of my drawings to a nice French couple from Miami Beach; it was soon followed by a sale of one of the very talented Georgia Nassikas to a Miami couple. Later on the day there was a sports celebrity sighting in the booth, as legendary golfer Phil Mickelson and his wife dropped by the booth, took notes and pictures and admired some work... more on that later. As the fair closed at 8PM, as we were packing we spent 45 minutes with a last minute collector who ended up buying two of my drawings and commissioning three more. Artomatic is coming back on 2017! to host a signature event in the spring of 2017. They anticipate attracting a large and diverse crowd showcasing a variety of creative work, including visual art, music, film, live performance, fashion, and more. 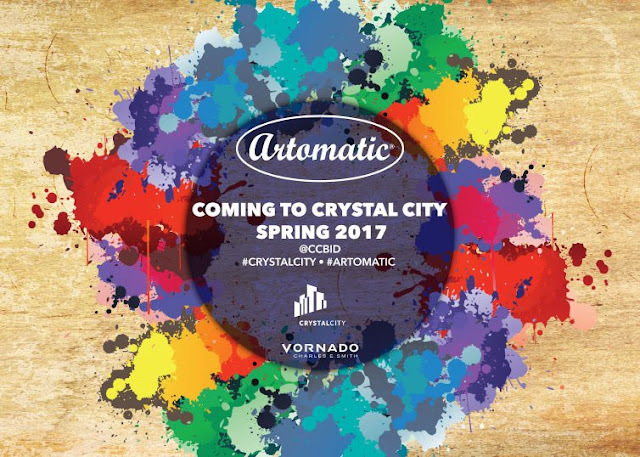 Look for more information about the next Artomatic in January when they kick off the New Year with a spring event in Crystal City! There is a certain connection that exists between the success and survival of big events, the hosting city, people, businesses and traffic. Make it hard for people to get to a concert venue, and they won't go. Make it difficult for people to get to a sporting event, and they'll stay home and watch it on TV. Make it impossible for people to drive to art fairs during ABMB and they will not go to the fairs. The cities of Miami and Miami Beach have a cash cow going on with the explosion of the Art Basel week of art fairs. By my unofficial count, there are no less than 26 art fairs going on around the Greater Miami area, plus countless side art events, plus museum parties, etc. They generate a lot of business for the local area, a lot of tax revenue for the cities and a lot of good stuff for Miamians. And all that is in extremis if the cities (and the fairs) do not do a better job of traffic management. "All they need is some police presence guiding and directing traffic!" noted the exasperated Uber driver. "Just like they do for concerts or football games; you never see this kind of traffic nightmare in those cases... why?... because the friggin' cops are on the corners directing traffic!" I suspect that in those cases, the events/venues have a contract with the local police force, so that they pay a fee to get the traffic coverage. For the last two nights in Wynwood, traffic has been a nightmare, often taking over an hour to move one traffic light. I hear that in Miami Beach it is even worse. Unless resolved, this is going to kill the fairs in Miami and Miami Beach. We've already heard complaints over the last years - this year has been the worst. "You can't get an Uber or a Lyft," noted an exasperated collector via text last night. "They can't get in the area!" This has to be fixed. All the Wynwood art fairs, and all the Miami Beach art fairs needs to get together and arrange for police support during the art fairs - there hasn't been any for the first day or two...this is not just advice, but a must do unless they see the traffic jams kill attendance and thus infect the subsequent death of the fairs. You never want to hear: "I used to go to the fairs, but now it's impossible to even get in... so..."
Art fairs are run by business entities; not artists - if this issue is this clear to most attendees and most exhibitors (who also have to get to the fairs in and out), then they must also be clear to the most casual observer. Miami/Miami Beach: Fix the traffic jams, or the fairs will die off. Update: On Wednesday and Thursday night cops magically appeared (at least in Wynwood) and traffic improved significantly - it's still packed, but at least moving a little!